•	January 18th 2018, Aspire Global expanded the gaming portfolio through the game hub of iSoftBet with access to dozens of games providers licensed in multiple jurisdictions. •	January 29th 2018, Aspire Global launched Sportsbook through the proprietary brand Karamba; aiming at becoming the first provider of a full turnkey solution to sport operators. Sportsbook is an attractive addition to the B2B-offering and part of the long-term plan for strategic growth. •	February 26th 2018, the new iGaming brand Goliath Casino went live on Aspire Global’s iGaming platform. Goliath Casino will become one of the first partners to also offer Sportsbook. •	March 5th 2018 Cofina Media was granted a betting license enabling the launch of Sportsbook in Portugal. The platform was legally and technically certified well in time for the launch. •	April 3rd 2018, Aspire Global finalized the issue of a €27.5 million senior secured bond loan under a €80 million framework for M&A purposes. The company has applied for a listing of the bond on Nasdaq Stockholm. •	The Board of Directors proposed the election of Aharon Aran as new Board member, replacing Pinhas Zahavi from May 8th 2018 until the next Annual General Meeting. Present Board members Carl Klingberg, Fredrik Burvall, Tsachi Maimon and Barak Matalon, were proposed for re-election. •	April 17th 2018, Aspire Global signed an agreement on platform services with Aller Media Denmark, a company within Aller Group, the leading publisher of magazines and newspapers in the Nordic region. Aller Media Denmark will be launching an iGaming brand in Denmark in the second quarter. •	May 1st 2018, Aspire Global’s Danish gaming license was extended until 2023.
response exceeded expectations and we look forward to putting the product to the real test as the World Cup starts in just over a month. Meanwhile, we are exploring a number of M&A-opportunities and increase the focus on Karamba. After a seasonal, slower start to the first quarter contrasting the strong year-end, volumes rebounded creating a very positive trend that lasted all the way in to the second quarter. We feel confident in reaching solid year-on year growth in line with previous performance. The past year we expanded the customer base with a number of key accounts that quickly reached substantial levels of contribution. We are becoming better at assessing future potential for a tentative brand, as well as long-term performance based on early indicators. We also wish to focus more on bigger brands than previously. Against this backdrop, we decided to streamline the platform somewhat in conjunction with the recent technology roll-out, upgrading bigger brands to the new standard while closing down some of the operators with persistent low activity, creating a more solid customer-base. The launch of Sportsbook in January was a major event for the company and the sports vertical will be live with three brands in time for the World Cup in June. The initial reactions to the sports vertical exceeded our expectations, enabling new partnerships and allowing Karamba to target an entirely different audience. We invested significantly in marketing campaigns for Sportsbook during the first quarter, and will continue to do so going forward, expecting a positive impact in the quarters to come. We also continue to broaden our offering in other ways, including yet another new vertical targeting a new audience and intensified game development. We see a particular interest in our own games from our own players, partners’ players and external operators, another growing target group. We have not emphasized game development before, but it is an asset we intend to develop from now on, as it is a successful and profitable product that gives us to control over additional parts of the value chain. We are very excited about the new partnership with Aller Media Denmark; a company within Aller Group, the leading Nordic publisher of weeklies and magazines with a strong online presence. This is exactly the kind of partnership we are looking for in regulated markets going forward. We have seen the strong effect with Cofina Media in Portugal and we hope to repeat the trend with Aller Media Denmark that will become one of the first Nordic media companies to add an iGaming-offering to their business. Aspire Global has been operating in Denmark for six years under a gaming license which was recently extended until 2023. We will also be applying for a Swedish license in time for the regulation of the Swedish gaming market in 2019, following a recent bill proposed in April. Q2 started off on a positive momentum, revenues in April were up more than 60% compared to April 2017, and 33% up compared to the average monthly numbers in Q1 2018. We continue to monitor the progress for Sportsbook in time for the World Cup in June. 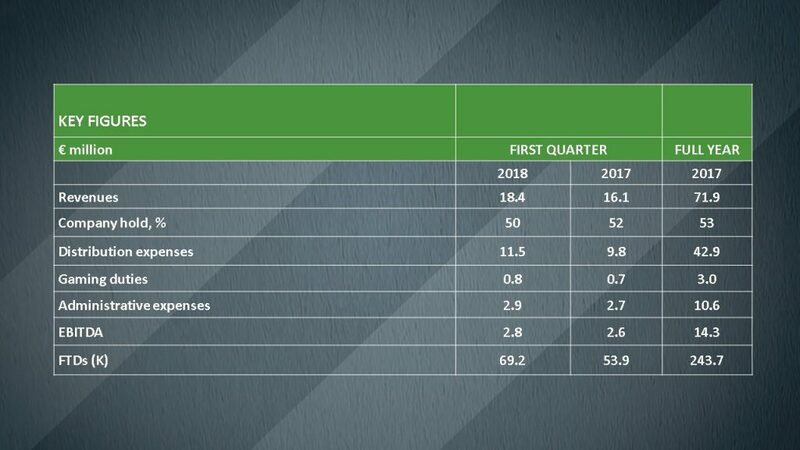 Q2 will be the first full quarter to include revenues from the sports vertical, which constituted nearly a tenth of the B2C-revenues in April. The finalized bond enables us to explore potential acquisitions closer. We look forward to see the results of our recent B2C-initiative, enabling a dedicated organization to pay proper attention to the strong proprietary Karamba-brand and the sports offering. We also prepare for the Swedish regulation, both in terms of platform-certification and potential agreements, where we see interesting growth opportunities in the partnership with media companies in particular. (MAR) and the Securities markets Act. The information was submitted for publication by the contact person above at 08:15 am (CET) on May 8th 2018. Today, on May 8th 2018, at 10:00 (CET), the company CEO, Tsachi Maimon, and CFO, Motti Gil, will be presenting the report and answering questions at a teleconference (in English), which will be webcasted live through the following link: https://financialhearings.com/event/10775 . The meeting, including the Q&A-session, is also available by calling one of the telephone numbers below. The complete interim report and the presentation material is available at http://www.aspireglobal.com/investors/#the-press-releases.